Above is a plot of the measured speed over a period of many years. 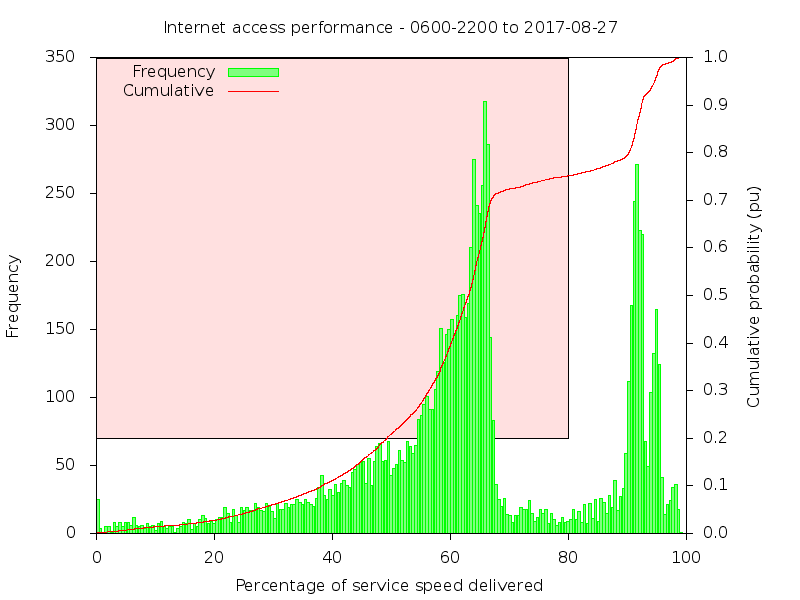 The green bars are a frequency histogram of the distribution of measured speed, and it can be seen that it was most commonly well below 30% of the rated speed. 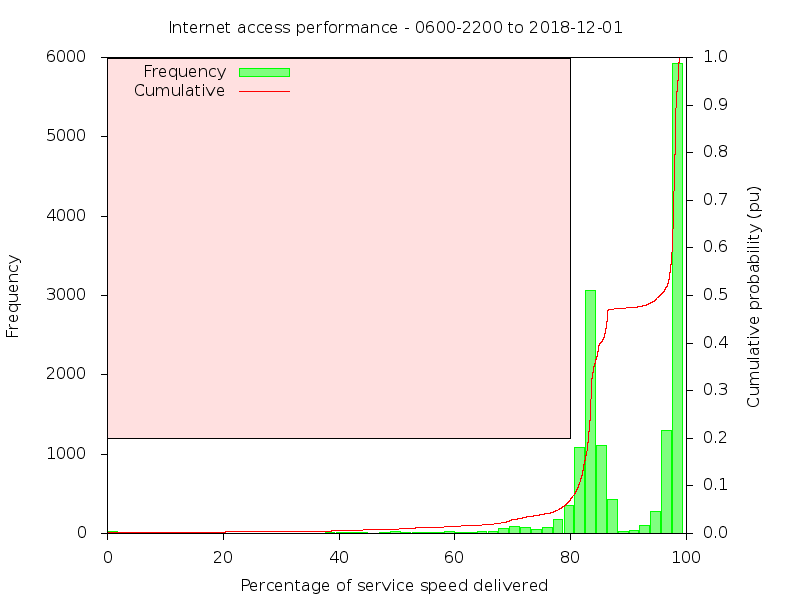 The red line is a cumulative frequency plot of the same data, and shows the percentage of time where speed was less than that a given normalised speed. So, for example 25% of the rated speed was exceeded 50% of the time. Now our criteria is that speed is more than 80% of the rated speed for more than 80% of time. Reading the graph, 80% of the time speed exceeds only 9% of the rated speed. The red shaded area provides a quick assessment of compliance, if the red curve passes through the red shaded area, the Service Level was not met. So, Telstra is a pretty big fail but when you are a monopoly provider and consumer protection is dismantled to make way for a government owned monopoly provider, consumers will be treated poorly. Needless to say, with this history, Telstra and its associates are out of consideration for future service. 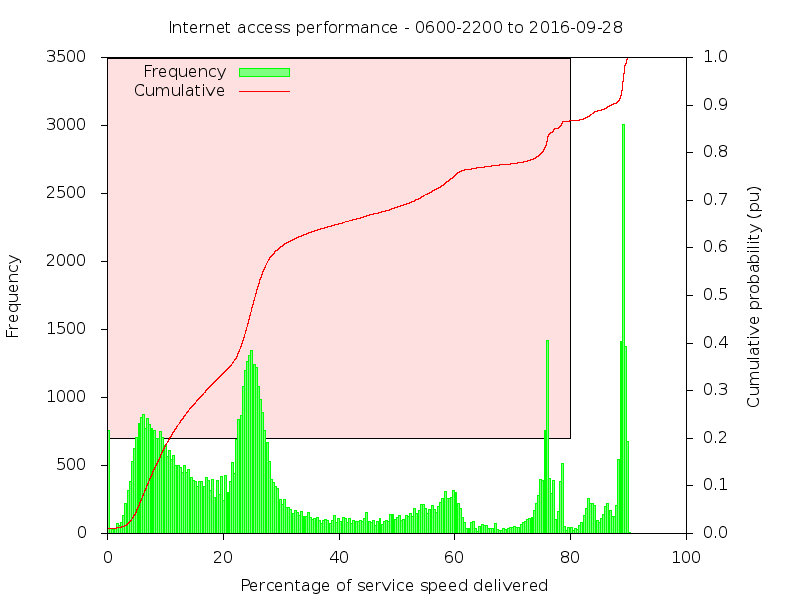 At first opportunity to choose an alternative supplier once NBN was available, a service was taken with iiNet. 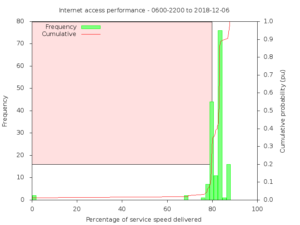 Well, iiNet was better than Telstra, but not much better. Now our criteria is that speed is more than 80% of the rated speed for more than 80% of time. Reading the graph, 80% of the time speed exceeds only 50% of the rated speed. 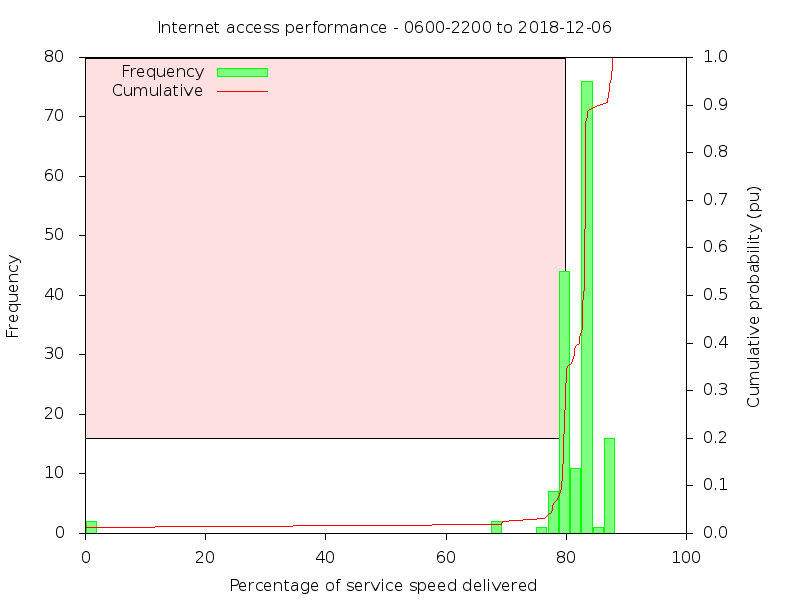 As a result of the underwhelming performance of iiNet, I churned to Amaysim. Now our criteria is that speed is more than 80% of the rated speed for more than 80% of time. 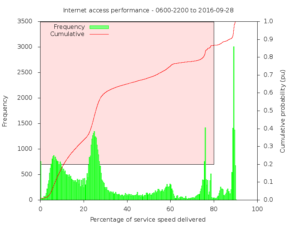 Reading the graph, 80% of the time speed exceeds 83% of the rated speed. Now our criteria is that speed is more than 80% of the rated speed for more than 80% of time. 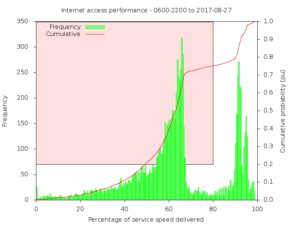 Reading the graph, 80% of the time speed exceeds 80% of the rated speed. My long held independent VOIP service did not work properly and Southern Phone could not fix it, all they could do was restate their position so yet another churn. Exetel had several provisioning issues, and it is working after a significant disruption to service. Let’s visit its performance in a month (unless something goes pear shaped before then). Why is it that providers don’t deliver most of what the customer pays for most of the time? The only supplier to make the grade was Amaysim, and they left the industry citing the difficulty in achieving profit. There are probably several factors, but uppermost will be that government does not want strong consumer protection because they own the monopoly fixed broadband enterprise and have a mind to sell it at a profit (don’t laugh). 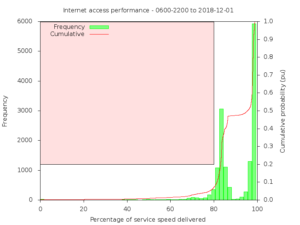 If you are not systematically measuring the performance of your broadband service, do you know whether you are getting what you are paying for.